The Smell-O-Scope allows the user to smell odours over astronomically long distances ("If a dog craps anywhere in the universe, you can bet I won't be out of the loop"). 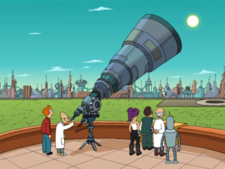 It was created by Professor Farnsworth in 2999 and won the Academy of Inventors Academy Prize in 3000 after the prize had been taken away from Dr. Ogden Wernstrom as it became apparent that he was a jackass. The degree of odour can be measured on a meter called the "Funkometer". It is unknown how the device functions, but it apparently has a lens and a stench coil. As Cubert points out, it is impossible for odour molecules to travel through the vacuum of space and reach the user's nose. However, it is possible that the Smell-O-Scope actually analyzes various spectrums, determines the chemical makeup, and reproduces the smell within its nostril-tubes, much like a television reproduces sounds and images. This page was last edited on 11 October 2014, at 18:35.